Over the weekend, I gave my coffee table a makeover. You see, my table started out looking like this. A $12.99 thrift store find that had definitely seen better days. Much better after a little sanding, staining and a few coats of polyurethane. But 4 years later I grew tired of the color. It's a functional, sturdy piece of furniture so I didn't want to replace it. I knew I could easily update it with paint. Using my HomeRight Finish Max Pro Fine Finish Sprayer made this project quick and easy. I bought a gallon of interior Oops Paint at Home Depot. I was able to buy some great paint for a much cheaper price. Thin the paint with water and mix well before spraying. I painted my table outside. It made it much easier for clean up. Elevate the legs with a few bricks! Painting with the HomeRight Finish Max Pro Fine Finish Sprayer was much faster than using a brush or roller, with perfectly smooth results. Most important tip, clean your paint sprayer immediately after each use. I used my garden hose for fast clean up. I love the new color! It's just my style and perfect for this space. We also eat, drink and put our feet up on the coffee table. To prevent water rings, I make coasters easily accessible. I hope this makeover inspires you to give new life to an old piece of furniture as well. I'm excited about my new paint sprayer! It will make future paint projects so much simpler and faster. *Thank you to HomeRight for providing me with the Finish Max Pro Fine Finish Sprayer. All opinions expressed in this post are my own! Looks great! The table has a wonderful, classic shape. Great color! It looks beautiful! Absolutely love it Brandi. I didn't get around to using mine this weekend, and the time change makes it so hard to beat the dark. Hopefully I use mine this upcoming weekend! What a wonderful look you've achieved in changing the color and texture of your table. It has great lines and now looks fabulous! Love the new color Brandi. I need to look into one of those paint sprayers! Looks great, Brandi - Nice work! I would love to paint with a sprayer. It seems so much easier! Have a great week. Wow, I love it, Brandi! It looks fabulous with your amber accents! It's gorgeous! And I love the way you have it styled! What a gorgeous transformation! I love buying oops paint. I always look for it at Home Depot. Such a nice table and I love how it's styled. So pretty! Please don't make me refinish any more furniture though. I am upholstered and painted out. I have 2 more coats of poly to put on my coffee table and then I am through until at least after Christmas. Brandi your table looks beautiful, love the color. Oh wow, that is quite a makeover :) I love it. It looks so much better and you would have never known you got it at a thrift store. Nailed it! You made it yours & it looks fab, B! I LOVE everything about this table and the decor on top and bottom! Great color and did you have to put some kind of protective coat over the paint? Love this table and the outcome is beautiful. So great to do with the sprayer. I've painted a million makeovers for customers in my time, but never with a sprayer. It would have made the process so much easier. Love the color and it looks great in your room. Wow what a result! Looks like brand new! Wow! What a perfect looking table! Are those wood slice coasters too? Love them! It's brand new now. Love the color! Your table looks fantastic. You did a great job on it. I really like the stain. I prefer the darker wood, and this is rich looking. A combination of hard work and a little love, and now look at it! NICE JOB! I will have to purchase the HomeRight machine for a weekend job. Thanks for the post. Incredible makeover! One of the most dramatic I've seen in a while! From drab (at the thrift store) to fab with your creativity and patience. When a piece of furniture is sturdy and in relatively good shape, there's no reason to ditch it. I love it that you took the initiative to just update it by changing the color and patina. The sprayer seems to have made the job a breeze! Love your table's new look Brandi - I've heard such great things about their paint sprayers! Incredible, this looks brand new:) I would like to paint one of my brown chairs white, but I'm feeling too intimidated by the sanding procedure, do I really have to sand before i paint? Brandi, God has really blessed you with a gift of decorating and interior (and exterior) design. I really love reading your blog! And am so very proud of you! 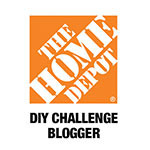 Saw the post about your Christmas décor on the Home Depot blog...AWESOME! Brandi, great job. Oh how I love oops paint and leftovers on Craigslist. I have a question for you... how has your sprayer held up? Was this the first time using it or have you had it for a while? 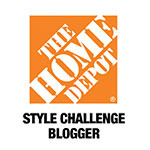 I'm so excited for you that you were invited to join the Home Depot Challenge! How exciting! I can't wait to see what you received . . . and then what you do with it! You did a great job on your coffee table! I love the color you chose! Great choice :0) It also compliments your brown couches quite nice! Love the new look you gave your table. And the paint sprayer makes it looks so easy to do. Your table turned out beautifully. I would love to take one those sprayers for a spin. 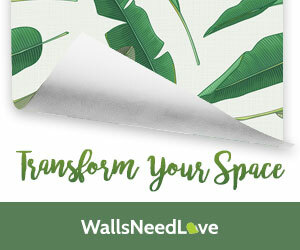 I love your makeover, looks SO good ~ I've been dying to try a paint sprayer - please tell me its easier than using spray paint, which I loathe! very nice brandi♥ i love updating anything with paint! i want to check out that oopss paint section at home depot, i did not know about that :) thanks for sharing!